Order by clicking the book cover above! I have a particular weakness for men and women with stories of dates gone horribly wrong. And I think I’m already on record as having a general weakness for all kinds of women. 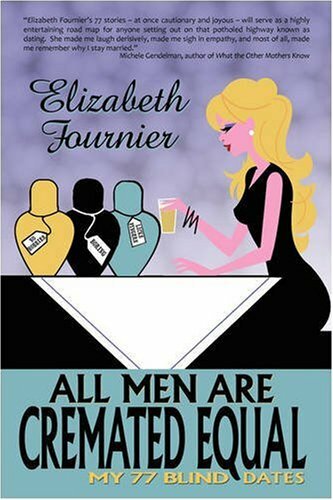 Add that to the fact I frequently like to help new authors, and how could I say no to Elizabeth Fournier, who has written the ticklish new book, All Men Are Cremated Equal: My 77 Blind Dates. Besides amusing us with psycho-social encounters, Elizabeth brings an extra dimension to her story thanks to her vocation: she’s mortician. She is also the voice of the autopsy exhibit in the forensic wing at the United States National Museum of Medicine. Oh, did I mention she lives in a boring little town—Boring, Oregon. And because of that, she’s become a reality TV star on MySpace known as The Green Reaper. More about that, later. And here’s a spoiler alert: there’s a happy ending to her book.